It is almost three weeks since the New Years’ “no more sugar” resolutions and that’s about long enough to go without some tasty bakery treats. The after the holidays pantry is always an assortment of odd holday and Christmas dinner leftover ingredients that I don’t want to save for a year and re use. I know canned goods are suposed to last for years but I am just not a fan of making dinner out of a three year old jumbo can of sweet potatoes. 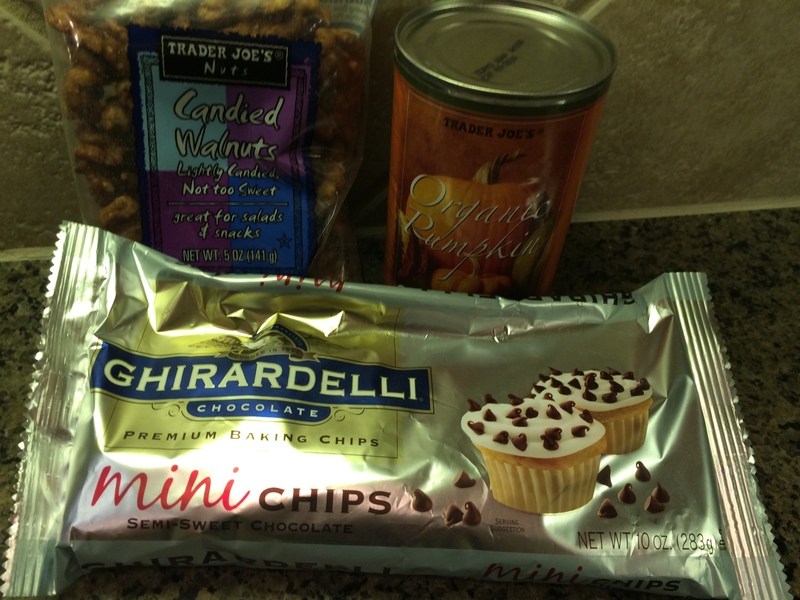 I checked out the far reaches of the pantry today and here were three of my favorite ingredients: Trader Joe’s canned pumpkin, Ghirardelli mini chocolate chips, and Trader Joe’s candied walnuts, After checking out a couple of recipies online, I adapted one to fit what I had. 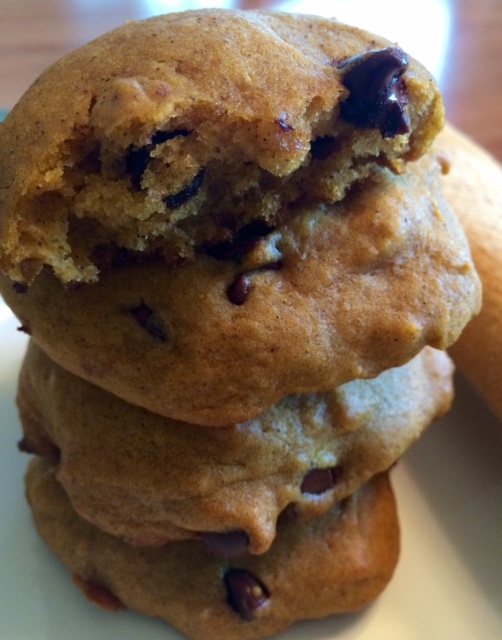 In the bowl of a stand mixer, combine sugars, vegetable oil, pumpkin and vanilla. Mix on medium for about 1 minute. Add egg, mixing until just combined. In a medium size mixing bowl, whisk together flour, baking soda, baking powder, salt, and spices. Reduce speed to low and gradually add the dry ingredients, mixing until combined. Remove bowl from stand and fold in the chocolate chips and walnuts by hand. Scoop by 1/8 cup onto prepared cookie sheets and place in oven to bake for 10-12 minutes or until the tops are firm and light brown in color. Remove from oven and allow to cool on sheets for 3 minutes before transferring to a wire rack to cool completely. Store in an airtight container or refrigerate. Enter your email address to follow this blog and get new recipes and posts by email. Hawks Restaurant- From Farm to Table! Twin Pines is a quality, customer-service oriented home improvement contractor in the MetroWest Massachusetts area.